War for the Planet of the Apes finds blockbuster action in fighting our own impulse to violence. It's not unusual for genre fiction to offer compelling allegories for our time. It's considerably more rare for those allegories to be so thorny that you need to wrestle with them for a while. Three movies into this 21st-century incarnation, the Planet of the Apes saga has become one of popular culture's most fascinating explorations of humanity at its worst—and, occasionally, its best. In 2014's Dawn of the Planet of the Apes in particular, director Matt Reeves crafted a tale with echoes of the War on Terror slippery enough to make it hard to know whether we should be rooting for humans to win or lose. Now, with War for the Planet of the Apes, Reeves has attempted an even bolder gambit. This is a story told entirely from the point of view of the apes, with the few humans as the clear villains of the piece—and even then, there's a lot about the behavior of the movie's protagonist that challenges our notion of what makes a hero. That hero is Caesar (Andy Serkis), the chimp who still leads the ape troop in the Northern California forest, several years into the plague that wiped out most of the human race. An unexpected reappearance of armed humans alarms Caesar, and an act of mercy on his part unexpectedly leads to an attack that costs him dearly. When he learns the identity of the man responsible—a relentless warlord known only as The Colonel (Woody Harrelson)—Caesar makes the unfamiliar-to-him choice of seeking revenge. Any discussion of these movies must begin with a bow in the direction of Andy Serkis, whose motion-capture performances as Caesar are doomed to be accompanied by an asterisk when discussing great movie acting. His body and eyes provide the frame for the CGI-generated chimpanzee that give him soul, and create a character on whom the burden of leadership always seems to weigh heavily. In some ways, Caesar is the very model of great leadership: cautious, thoughtful, slow to violence, always considering the impact of his decisions on the lives of his charges. Serkis plays Caesar as Daniel Day-Lewis' Lincoln in simian form, and the result is just as magnificent. Such a comparison also makes it unnerving when Caesar becomes a force for retribution after suffering a personal loss. Where Dawn of the Planet of the Apes offered the ape Koba—a radical convinced that there is no co-existing with humans, to the point that he launches a false-flag operation to provoke war—as counterpoint to Caesar, the realization now is that Caesar has some Koba within himself. The motivating power of fear and anger are always clear in these movies, but there's no comfort in the possibility that a saintly, benevolent ruler can save us from our darkest impulses. Every one of us has to fight that urge. There's an external threat, too, and Harrelson does a fine job portraying the kind of separatist militia leader whose racist rhetoric always makes at least a small amount of discomfiting sense. War for the Planet of the Apes presents a mutation of the "Simian Flu" virus that has begun robbing humans of their speech, and The Colonel views it as an existential threat; "This is a holy war," he intones at one point, convinced that speech is a defining part of what makes us human. The fact that Caesar can also speak makes it easy to recognize how personal pain has led to The Colonel abandoning a fuller sense of the soul that defines humanity. All of that is heady stuff, which is never to suggest that these movies are tedious philosophical exercises. Much of the second half becomes a prison-escape movie, full of tension and close calls. It's also hard to ignore the grim tone that Reeves brings to these stories, which makes it particularly crucial to have a comic-relief character in the form of Bad Ape (Steve Zahn), a chimp who has been living in isolation in an abandoned ski lodge. 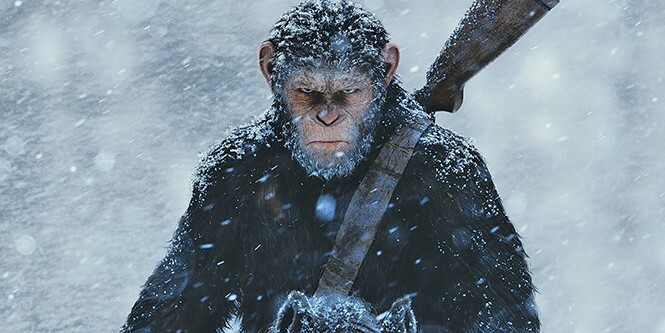 War for the Planet of the Apes might not be the kind of light-hearted fun we often expect from summer movies, but it's adventure with a richer payoff than beating the bad guy: It's about finding the strength to recognize the bad guy in ourselves.